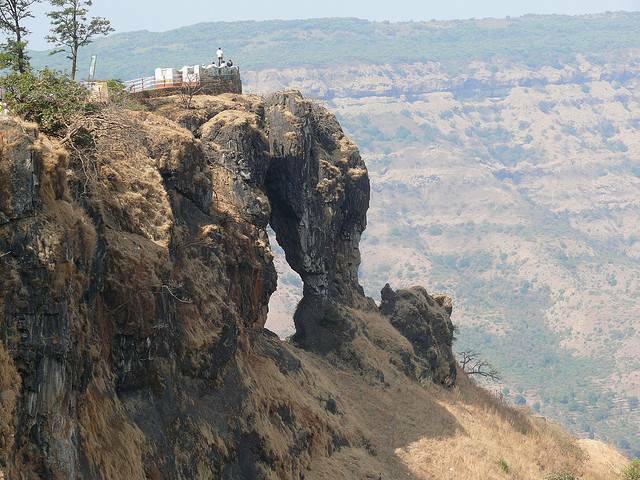 At 1290m height, this is one of the greatest viewpoints in Mahabaleshwar which one should not miss. En route to Venna lake, in the duchess road this amazing cliff is located overlooking the expanses of Deccan plateau. The River Krishna that meanders through the meadows and green valleys is a wonderful sight. Kate’s point got its named after Sir. James Malcolm’s daughter who had a liking to this spot. At the very edge of this rocky cliff, is the peculiar formation of rocks some of which jut out and hang by themselves wedging between each other with a huge hole in the middle. This arch is called the needle nose. During winter when the sky is clear and the Dhom Dam full, the view from this place is simply exhilarating. One can also get a view of the peaks of Kamalgadh, Pandavgadh and Mandardeo.